The Kelty Trail Ridge is one of the company's best offerings. Combining versatility, portability, and a healthy dose of affordability, this tent is the bargain hunter's dream come true. So whether you're looking for a family shelter or a spacious 1-camper abode, this lineup has something for you. The Trail Ridge is one of the least expensive models on the market, at least of those that offer some truly great features. The value you can get out of the $175 3-person model is well beyond the price tag. If you're on a budget, this should be your first — and probably last — stop. What makes this model so great beside the value? Well, it's lightweight, offers two separate doors on all models, is incredibly easy to erect, and is decently protective in bad weather. Of course, with such an inexpensive tent, there are going to be some drawbacks — chief among them: thin floors and oddly-designed floor plans — but we think the benefits outweigh the downsides. And we think you'll agree. Look at the Kelty Trail Ridge 4-Person Tent's technical specs to get a better idea of what this model's made of and what it offers. Vestibule Area — 15 sq. ft. & 15 sq. ft.
Each model in the Trail Ridge lineup — from the 2-person to the 6-person — offers dual doors and two vestibules. If you've ever been camping with multiple people, you know what a positive difference this can make. 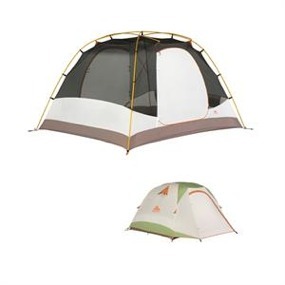 While the door design is something to jump for joy over, the biggest advantage of all is this tent's price. For less than $200, you get a much-better-than-average shelter that boasts a lot of features that are common to more expensive models. You get much more than you pay for with the Trail Ridge. The two-door design is beautiful, but unfortunately, the floor plan is a little wonky. The short length of the tent is door-to-door, and if you're a regular-sized Joe, this might mean having your feet hang out of the tent. To avoid this, of course, you have to lie perpendicular to the doors, which is fine if you're camping with two people. But once you get a third in there, that means climbing over people to get out in the middle of the night when nature calls. There's plenty of elbow room, but the Trail Ridge could have benefited with a design that has the doors rotated 90 degrees. The floor of the tent is awfully thin. If you don't buy a foot print, you'll need to be extra careful not to erect the shelter over sharp sticks or stones that could puncture the fabric and allow water to enter your domain. What do real consumers say about the Trail Ridge's design and performance in the field? 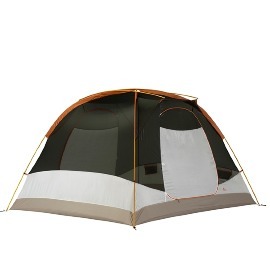 Honestly, you will not find a better tent at this price. For less than $200 — much less in some cases — you can have a perfectly decent shelter in the Kelty Trail Ridge. It's easy to set up, it's light to carry, it's dependable in foul weather, and it offers plenty of elbow room. What more could you want for such a small investment? The answer should be: Nothing. If you're on a budget, this shelter is your one-stop shop. Have you used the Kelty Trail Ridge Tent? Share your tent review and let us know how it worked for you!